Annabel represents a revolutionary jump forward in casual games - it is the first casual game with 3D characters in a 3D world. Welcome to Annabel's world, set in Ancient Egypt. Princess Annabel has been captured by held prisoner by the evil high priest Amertekh, who plans to marry Annabel to become a full-fledged Pharaoh. Meanwhile, Annabel has her eyes on the young prince Akhenaten. Akhenaten, who will become the next pharaoh, has been force to flee Egypt, but he won't leave without his beloved Annabel. 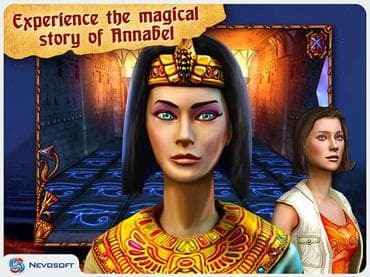 It is up to you to help Annabel escape from the evil high priest, explore a pyramid and open a sarcophagus, visit a local fishing village, and sail down the Nile to a temple of the all powerful god Seth in your quest to help Akhenaten and restore order to Egypt! Free Game features: - Amazing 3D characters in a 3D world; - Journey through the lands of ancient Egypt; - Original storyline featuring compelling characters; - More than just hidden objects - find the clues and solve puzzles to unlock the adventure. If you have questions about Annabel game, please contact us using this form.